Two weeks ago I was in Kansas to see a friend and decided one evening to drive three hours to Watonga, Oklahoma to visit the gravesite of David Pendeleton Oakerhater (1850-1931), the first Native American (Cheyenne) person ordained a deacon by the Episcopal Church and the first and only American deacon to be named a saint by any denomination so far as I know. I have been intrigued by Deacon Oakerhater’s life ever since first learning about him in 1998 while writing a book about the United Methodist diaconate. A few months ago I had the opportunity to get re-aquainted while writing an article about him for a new Encyclopedia of Christianity in the United States (Rowman and Littlefield, forthcoming). My three-hour drive to Watonga, Oklahoma was a time for me to reflect on Oakerhater’s life, the friendships he formed, and the history of injustice toward American Indians which many Christian denominations – including my own United Methodist Church – have been trying to better understand and confess wrongdoing for the sake of the Gospel of reconciliation we strive to profess. United Methodists have had a number of services to express this desire for reconciliation. The Oregon-Idaho Annual Conference had theirs just a few months ago; The Eastern Pennsylvania Conference will do the same next year. Such services surely have their place, but I think it is fair to say that many white folk have a hard time knowing what to do next. My visit to the Indian cemetery in Watonga was a modest personal next step. I wanted to honor the memory of a Native American deacon saint whom I admire. I am a United Methodist deacon myself, after all, who grew up on the Minnesota plains which in some ways are not so very different from the rolling hills of central Oklahoma. After arriving in Watonga and passing by an Indian Baptist Church and then several other churches in this small Oklahoma town I stopped to ask a boy riding his bike where the Indian cemetery might be. He fetched his grandmother who kindly explained to me where it was – immediately south of the airport. I followed her directions and arrived at the cemetery just as the sun was setting. I read nearly every tombstone in that graveyard before finally finding Deacon Oakerhater’s grave under a tree. In retrospect, I suppose it was right to first read the names of the Indians whom he served for so many years and the names of those who died long after the saintly deacon’s ministry was finished. Deacon Oakerhater gave his life for them, after all. Oakerhater represents for me also a story of reconciliation through friendship. He took the name “Pendleton” from Jeanie Pendleton whose family helped support his education. His ordination as deacon was also encouraged by another friend, Mary Douglass Burnham, who had started a ministry for Native Americans at Emmanuel Episcopal Church in Boston – a congregation in which I had spent an afternoon of research (on Charles Cullis) for my dissertation over a decade ago. Oakerhater’s friendships with these people and his willingness to recruit other Indian students for the Carlisle Indian Industrial School in Pennsylvania raise questions for me – the answers for which mostly remain hidden. What were these friendships like? Were they of a condescending quality or were they deeply genuine? After returning to Oklahoma why did Oakerhater recruit Indian students for the Carlisle Indian Industrial School? Did he find something truly redemptive in this institution? How so? I believe he did find some things helpful about his time in Carlisle, because the alternative explanation of Oakerhater being a mere pawn in the hands of whites to further harm his people just doesn’t square with who he was and is simply not supported by the evidence. Oakerhater was a bicultural or “liminal” person who sought to build bridges at a time of tremendous cultural upheaval for his own people. Doubtless he was misunderstood in his day and will be misunderstood in our own day as well. 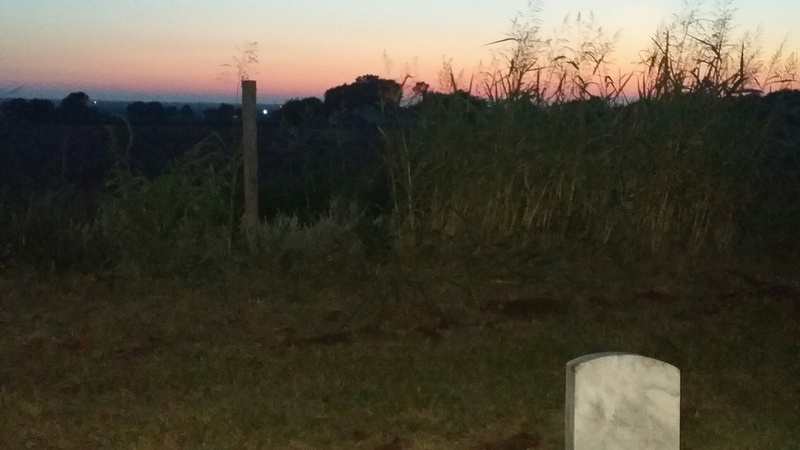 As I sat next to Oakerhater’s grave and watched the Oklahoma sunset a couple weeks ago I prayed for my friends, my community, and my work just as Oakerhater no doubt prayed many times so many years before. I prayed for Native American communities too in my new state of Oregon and resolved to learn more about their stories just as I learned about Oakerhater’s story. I prayed too for my friendships – and for future friends – where the good but slow work of reconciliation might also grow. Deacon David Pendleton Oakerhater’s feast day is just a few days away on September 1. I will celebrate it.